Has the participation period of your promotion ended and it’s now time to carry out the final sweepstakes to find out who the winners are? Easypromos offers you a comprehensive tool to help you pick the winners and alternates of a contest or promotion automatically and at random. The tool will also generate a certificate of validity which you can share with users, providing security and transparency to your promotion. This tutorial will help you get to know all the features of this tool and learn how to make the most of it. Note: This tool is available for all promotions created with Basic, Premium and White Label versions of the platform. 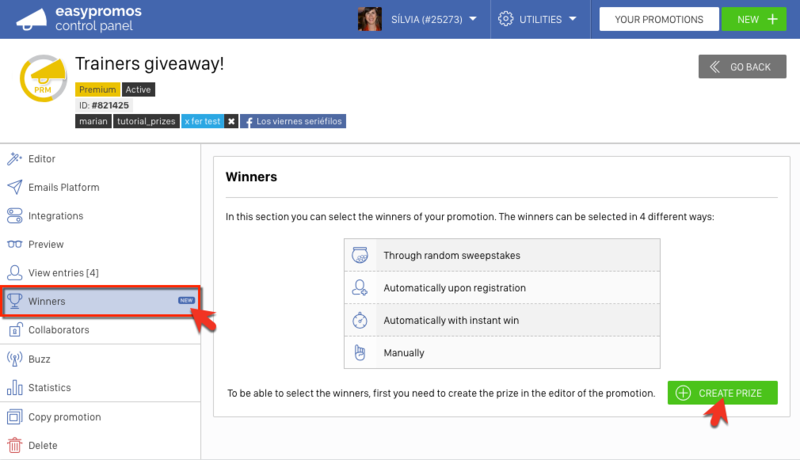 For Facebook sweepstakes based on a post, check the tutorial to pick the winners among all users who Like or Comment on a post. For Twitter sweepstakes, check the tutorial of how to carry out a sweepstakes based on Retweets, and the tutorial of how to carry out a sweepstakes among all your Followers. For comments-based Instagram sweepstakes, check this tutorial. For YouTube sweepstakes, go to the Tutorial: Run a sweepstakes from comments on a YouTube video. The “random draw” assignment method from the ‘Winners’ section of the promotion allows you to run a random sweepstakes among all the registered users in a promotion. You can choose to either carry out a sweepstakes among all participants or you can specify a particular segment of users based on a series of criteria which define them, such as their country, time of registration, the social network they participated from, and so on. The tool includes a multi-sweepstakes mode – for carrying out multiple sweepstakes in a single promotion among different segments of users (only Premium and White Label promotions). The tool also offers administrators the chance to assign additional participations, exclude specific users, exclude previous winners and it facilitates the quick and efficient management of winners and alternates. Below, we go through each of these features, step by step, to ensure you don’t miss a thing. Once the participation period is over and it’s time for you to carry out the final sweepstakes, you should go to the “Winners” section in the Easypromos control panel. On this first page you will see the sweepstakes to obtain the winners that was created when you created the “By random draw” prize while configuring the promotion. Click on “Run sweepstakes”. 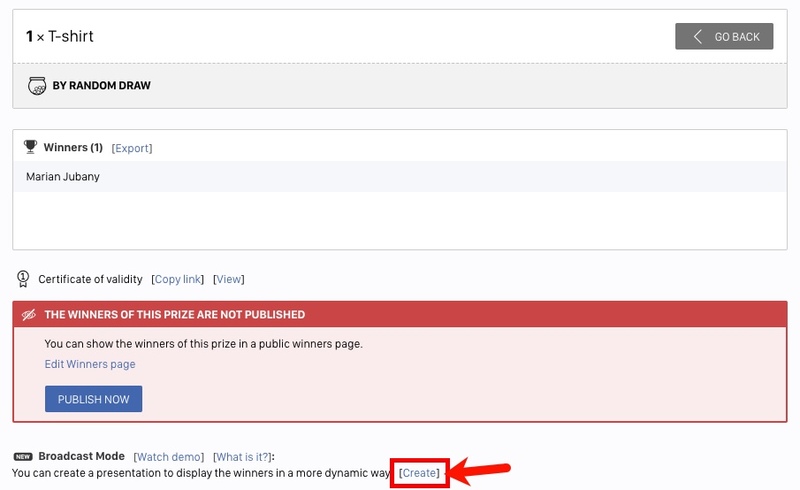 If this is the case, click on the “Create prize” button that will take you to the Editor > Pages > Prizes and follow the step by step guide to create a prize. Sweepstakes icon. This bar shows the type of prize assignment you’re doing. Look at the icon to identify the type of selection that you’re carrying out. “All the participants”. Sweepstakes among all participants, excluding automatically all participants marked as ‘rejected’. This is the most common sweepstakes. Click “Continue” to go ahead with the most simple draw. GO TO STEP 3. “A group of participants”. Sweepstakes from a specific segment of users. To do this, you can use the filter tool to define the segment of users you want to create for the draw. For example: only enter into the final draw users that have obtained maximum score in the quiz or users who have participated during a specific period of time. Click “Select” and learn how to select the finalists. This option allows you to define a segment of users according to different criteria and carry out a sweepstakes among them. Next, the tool will show you the list of all the participants with the advanced filters to segment them and select the finalists. 1. Create the segment that you want to make them finalists of the draw. In the example: I want to give a specific prize to those who have marked the checkbox to receive the brand’s newsletter. 2. Add the filter. You can filter by the fields of the entry form that you have enabled, and also other information that we have about the activity of the participant. I’m going to give a different prize depending on country of the participant. I will segment by connection country. I’m going to raffle a prize among all participants that have obtained at least 5 votes. I’m going to raffle a prize among all participants that have obtained maximum score in the quiz. I’m going to raffle a prize among all participants that have obtained at least 2 recruits. Arrange the users after filtering. You can arrange them by last participants, first participants, most voted, with most recruits and with maximum quiz score. Limit the number of participants that you want to view. For example, to only see the 5 most voted participants and then run the sweepstakes only among them. All these filters allow you to carry out different types of sweepstakes and give away prizes dependent on the type of users, location, days, fields checked, etc. Check out some of the most common segments that you can filter with the platform. 3. Verify that the total number of participants change. In red you will see the number of selected finalists, in black the total number of participants in the promotion. 4. Click the “Select as finalists” button. You have created your segment of finalists! The tool will now show you the next step which is to give additional entries and apply exclusions. Finalists. This number tells you the number of finalists that you have at the moment, and are those that would enter the draw. View. 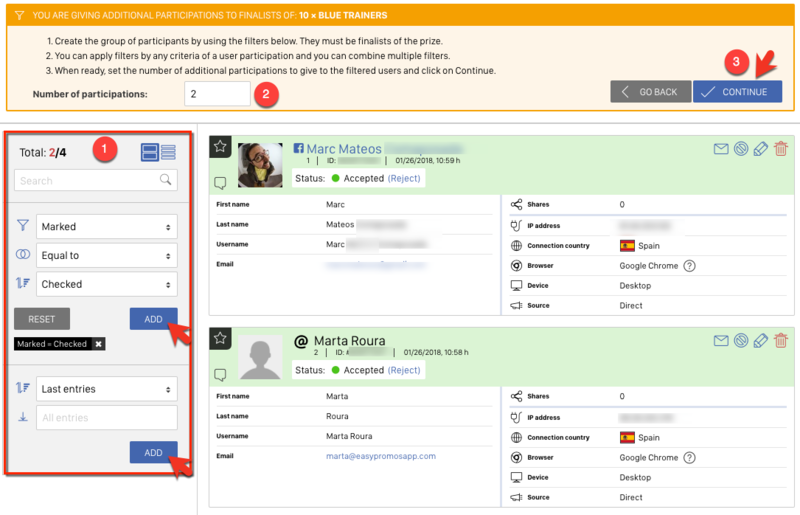 Allows you to see the list of participants and exclude any participant manually. Reset and select new finalists. If at some point during the selection process you make a mistake, you can use this link to delete the selection and start over. Manage additional entries. If you want to give additional entries to those that have earned it somehow according to some criterion, you can use this option. How to give additional entries? By default, the application will automatically assign each finalist one participation to enter the sweepstakes, but the administrator has the possibility to assign a number of additional entries, giving users who meet the requirements more chances to win the sweepstakes. Number of obtained recruits: number of new participants that each user has brought to the promotion. Points scored in the quiz: in trivia type quizzes and polls. Number of obtained votes: number of votes obtained by the user for their entry (image, video or text). 2. Click the button “Accept and apply entries”. 3. “Add additional entries using other criteria”. Use this button to give additional entries based on other criteria. The tool will take you to the list of entries so that you can filter by any field that you have configured in the entry form as well as other information that we have about the participantes. We will use the filter to the start date of the promotion, arrange and limit to 5. And we verify the number of finalists that we have now of the total number of participants. We insert the number of additional entries that we want to give. We click “Continue” to go back to the winner selection process. Exclude users from your blacklist: You can create and manage lists of users that you don’t want to enter your sweepstakes. These users will be able to participate in future promotions, but they can be automatically excluded from your sweepstakes without them knowing. Promotion: if you carry out multiple sweepstakes in a single promotion, you can exclude users who have won one of the previous sweepstakes. Account: exclude any user who has already won another promotion or sweepstakes that you have carried out from your account. The tool already knows how many winners it should select because you already indicated that when creating the prize. Add the number of alternates you want to select, in case you’re unable to contact one of the winners or need to make a last-minute substitution. The sum of the number of prizewinners and alternates must always be less than the total number of finalists. Do you want to know why it’s so important to select alternate winners? We give the answer in this blog post. You can run a test of the sweepstakes first where you will see some winners and alternates but it is not a valid result and there won’t be a certificate of validity. On the following screen you will see the names of the definitive prizewinners and alternates. A certificate of validity will be generated automatically for the sweepstakes you have just carried out, you will have the link to the certificate here. The last step is to publish the winners on your Winners page of the promotion and disseminate the result to the participants and your online community. Do you want to customize the shared content of the prizes page? Go to the Editor > Pages > Winners > Viral content and customize the text that will be shown when the page is shared. You can also customize the image that will be shared. In the content of the email you can insert any characteristic of the prize using the smart tags. You can for example show the name of the prize the user has won and also customize the email with the name of the user. Check out here the most common emails that you can create and automate in the Email platform. Have you made multiple sweepstakes? Remember that with the Sweepstakes Platform you can carry out sweepstakes among different segments of users within the same promotion. If you want to carry out another sweepstakes by selecting a different criterion (for example, if the first sweepstakes was for Twitter users, you could dedicate the second one to participants coming from Facebook), you just have to create as many types of prizes as sweepstakes you want to run from the Editor > General > Prizes. How can I access the sweepstakes of my promotion? 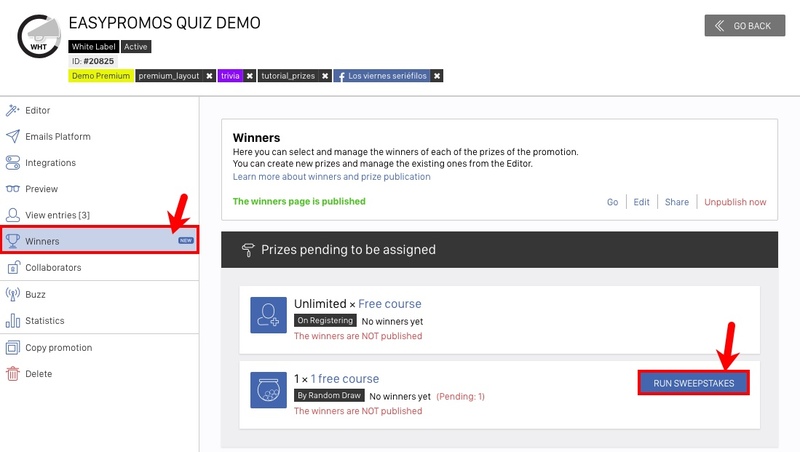 By clicking on “Winners” from the menu on the left side of the main management page of the promotion. How many sweepstakes can I carry out? In the Premium and White Label versions you can carry out multiple sweepstakes from the same promotion – as many as the segments of users you create. In the Basic version, promotion activation includes a single sweepstakes, and if you wish to carry out additional sweepstakes, you need to have an active Basic subscription ($29/month or $290/year).